Just like Paula alerting me to the baby robins at her parents’, which have fledged, another coworker, Andrea, alerted me to a Killdeer nest at her sister and brother-in-law’s place in Malta, NY. She actually called me last night to find out what kind of bird it was and to find out what they should do as a major landscaping project involving bulldozers and other heavy machinery was scheduled to commence there today in order to improve drainage. My advice, which was taken (as you can see in the picture), was to mark the nest with some kind of string to make sure no one accidentally squished the eggs. 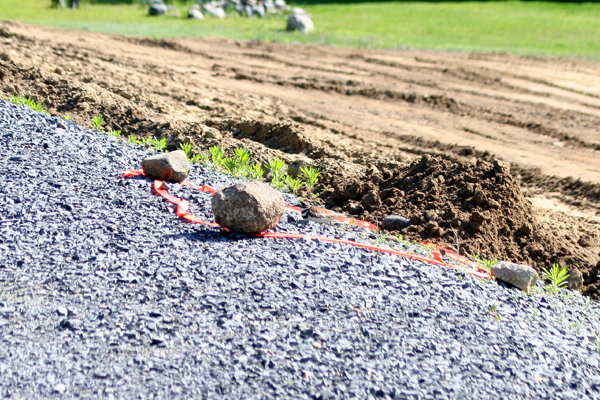 As you can see from the picture below, the bulldozer came close but the Killdeer stuck by its eggs. I refer to the Killdeer as “it” because according to my bird books both parents take on incubation duties and tend the precocial young when they hatch and leave the nest and I don’t think it’s possible to tell male and female Killdeer apart without having them in hand. Hatching won’t occur for awhile, as incubation takes between three-and-a-half and four weeks! While moving around the nest to get the sun behind me I guess I got too close, because the parent ran a short distance away, vocalizing, but just a single note, not the “Kill-dee” call for which they are named. I also wasn’t lucky enough to see (or photograph) a broken-wing ruse. 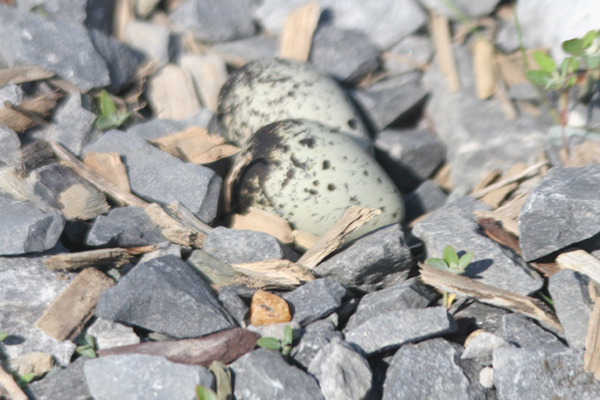 I did, however, take advantage of the bird’s momentary absence to get a picture of the two eggs in the shallow scrape that serves as a Killdeer‘s nest (update: a third egg was laid last night (5/31)). 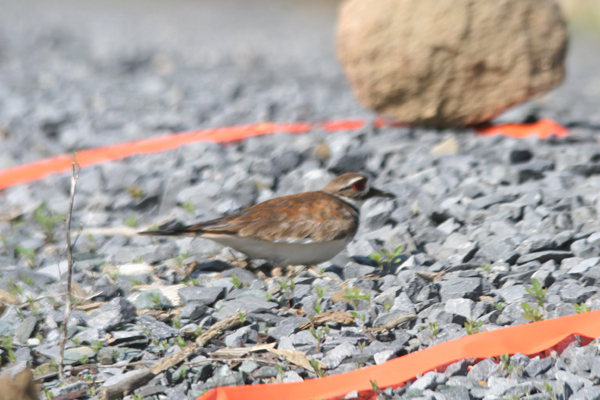 The Killdeer quickly returned to the eggs when I backed away from the nest. To see a more recent visit to the nest, click here. I enjoy watching nesting Killdeer but they do seem to find the worse places to nest! Do you know what you call a baby killdeer? A killfawn!! LOL only kidding but that’s what I like calling them! @Mary: No idea about the survival rate but nice blog! Corey – just got an update from my sister, now 3 eggs!!!! We had a nest right outside our fronnt door a few years ago and had the “broken wing” seeral times a day sometimes by two parents at a time. I felt kind of bad streessing out the parents so much but there was no other way tro get to our driveway except by the nest. They stopped doing it after a while – must have decided we were not a threat. The best part came after the “killfawns” hatched – we had 4 little bundles of fluff galumphing around for a few weeks – they were the cutest little things and seemed to get cuter as they became miniature versions of their parents. We had a nest on our driveway – they were due to hatch out Sat, but last night something disturbed them. My husband got up to check on them and there were only two eggs left! This morning as he went to work early all the eggs were gone. We are very sad, but they look like they have found a new spot on our driveway and are trying again! We shall see!!!! How long dies it take for the babies to be able to fly. And how many weeks is it when they finally go off on their own?